LA JOLLA—Saket Navlakha, an assistant professor in Salk’s Integrative Biology Laboratory, is one of 22 researchers to be named a 2018 Pew Scholar in the Biomedical Sciences. Each scholar receives $300,000 over four years. Additionally, Navlakha is one of a subset of five Pew Scholars selected for support by the Kathryn W. Davis Peace by Pieces Fund, which focuses on investigating health challenges in the brain as it ages. 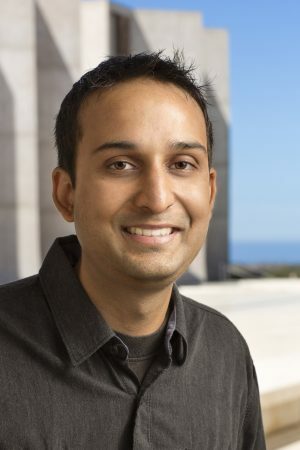 Navlakha, who holds the Pioneer Fund Developmental Chair, studies “algorithms in nature”—that is, how groups of distributed molecules and cells communicate and process information to collectively solve computational problems important for survival. Discovering such shared principles can lead to the design of improved computing algorithms and can provide a way to quantify and predict the behavior of biological systems. To accomplish this, Navlakha is bridging theoretical computer science, machine learning and systems biology and is developing collaborations with experimentalists to learn from biological data. For example, he recently showed that brains of fruit flies, in their efforts to identify similar odors, may have found a better way to perform “similarity searches” than computer algorithms, which also need to find similar items to recommend (such as products, songs or videos that are like our past purchases). He translated insights from the fly brain to develop a new algorithm for similarity search that improved search performance. He also applied this “algorithmic perspective” to study how plant architectures grow. He found that, like subway systems, plant architectures optimize their structures to efficiently transport nutrients, and that plants may have evolved unique strategies to solve build networks—work that could lead to the breeding of crops with enhanced yields. The scholars—all of whom have held assistant professor positions for three years or less—enter a vibrant community of researchers who have received awards from Pew since 1985. Current scholars meet annually to discuss their research and exchange ideas with peers in fields outside of their own. This year’s scholars were selected from 184 nominations, each submitted by a leading academic or research institution in the United States. The Pew Charitable Trusts is driven by the power of knowledge to solve today’s most challenging problems. We are an independent nonprofit organization—the sole beneficiary of seven individual trusts established between 1948 and 1979 by two sons and two daughters of Sun Oil Company founder Joseph N. Pew and his wife, Mary Anderson Pew.